A 60-year-old female came to our hospital with defective vision due to persistent diabetic macular edema and was treated with intravitreal ozurdex implant in the right eye. Three days later, the patient presented with diminution of vision, ocular pain, congestion, and hypopyon with no fundus view. B-scan ultrasonography showed vitritis, and diagnosis of endophthalmitis was made. Subsequently, 25-gauge pars plana vitrectomy was performed along with intravitreal vancomycin and amikacin and removal of implant. On culture, there was growth of coagulase-negative staphylococcus which was resistant to ofloxacin antibiotic. A week following treatment, there was significant improvement in the patient's sign and symptoms with improvement in vision. Our case demonstrated that acute endophthalmitis can occur following dexamethasone intravitreal implant. Intravitreal therapy with anti-vascular endothelial growth factor (anti-VEGF) and steroids has been used for treating macular edema in diabetic retinopathy and retinal vein occlusion. Studies have shown that intravitreal steroids improve the visual outcomes in eyes with persistent or refractory diabetic macular edema (DME). Larger studies evaluating intravitreal dexamethasone for macular edema including the ZERO Study and Ozurdex GENEVA study , did not show any major side effect like inflammation or endophthalmitis. However, in the light of potential risk of infection following intravitreal injection, we report a case of acute endophthalmitis following sustained release dexamethasone intravitreal implant for DME. A 60-year-old diabetic female came to our hospital with defective vision in both the eyes. She had undergone bilateral cataract surgery followed by pan retinal photocoagulation for diabetic retinopathy before 1 year elsewhere. Her best corrected visual acuity (BCVA) in the right eye was 6/36 and left eye was 5/60. Ocular coherence tomography was performed on both eyes, and DME was confirmed. She was then advised intravitreal bevacizumab injection in both eyes. After treatment, left eye condition improved with BCVA being 6/18, but right eye DME persisted with central macular thickness of 611 microns with no improvement in vision. To improve the visual acuity (VA) in her right eye, the patient was given an intravitreal ozurdex injection in the operating theater under aseptic precautions after obtaining a written informed consent and ruling out any potential sites of infection. Patient's blood sugar levels were controlled before procedure. She was painted with 5% povidone-iodine, and one drop of 5% povidone-iodine was applied in the fornix before injection. No preoperative antibiotics were started. Postinjection, ofloxacin eye drops were used three times a day for 3 days. Seventy-two hours later, the patient presented with pain and redness in the right eye with vision being only perception of light. On examination, there was conjunctival congestion, hypopyon with inflammatory membrane in the anterior chamber [Figure 1]. Fundus evaluation revealed Grade 4 vitreous opacity with no view of the retina. B-scan ultrasonography showed increased intravitreal echoes with intact retinochoroidal complex suggestive of vitritis. A diagnosis of acute endophthalmitis was made. We subsequently performed 25-gauge pars plana vitrectomy (PPV) with removal of implant from vitreous cavity in toto using a retinal forceps by converting one port to 20 gauge [Figure 2]. Aqueous and vitreous samples for microbiological analysis were taken. In the same session, a combination of vancomycin 1.0 mg and tobramycin 0.4 mg was injected intravitreally. The aqueous sample culture came negative, but vitreous sample showed growth of coagulase-negative staphylococcus on blood agar culture. The organism was found to be sensitive to gatifloxacin, moxifloxacin, vancomycin, tobramycin, and resistant to levofloxacin and ofloxacin. Postoperatively, the patient was started on topical gatifloxacin, tobramycin, dexamethasone, and cycloplegic eye drops. A week after vitrectomy and removal of the implant, condition of the patient considerably improved with BCVA being 6/36. However, the DME persisted preventing full recovery of vision. The dexamethasone drug delivery system (ozurdex) is an intravitreal device that contains 0.7 mg dexamethasone. It contains a polymer matrix that dissolves and releases the corticosteroid into its target tissues, the retina, and vitreous over the following months. The device is inserted into the vitreous cavity through the pars plana route. This implant was approved by the United States Food and Drug Administration for the treatment of macular edema secondary to vein occlusion  and diabetic retinopathy. For DME, intravitreal delivery techniques (intravitreal injection and steroids implant) allow for sufficiently high local concentrations of steroids to maximize their anti-inflammatory, angiostatic, and antipermeability effects in treating DME by bypassing the blood–ocular barrier while minimizing systemic toxicity. Few studies have been published demonstrating that the intravitreal dexamethasone implant can improve VA and reduce central retinal thickness in persistent or recurrent DME and prior anti-VEGF therapy. The incidence of endophthalmitis after intravitreal injection is low, ranging from 0.02% to 0.05% and not documented after ozurdex implant. In the main trials of ozurdex implant like GENEVA and ZERO study, the complications listed were eye pain, ocular hypertension, anterior chamber cells, cataracts, vitreous hemorrhage, and retinal detachment. No case of endophthalmitis was reported., The low rates could be attributed to less number of cases studied. A study by vanderBeek et al. concluded that the incidence of endophthalmitis was higher with intravitreal injection of steroids than anti-VEGF. They stated that this could be due to larger wound tracts from the 22-gauge needles used in steroid injections which allow easy bacterial penetration into the vitreous. Furthermore, since steroids are immunosuppressive in nature, they may contribute to endophthalmitis. In our case, despite giving the injection under aseptic conditions, the patient developed endophthalmitis 3 days after ozurdex implantation. One of the reason for developing infection could be that the organism was resistant to ofloxacin antibiotic which was used postinjection. As the vision was perception of light and clinical features suggestive of endophthalmitis, we immediately performed PPV and removed the implant on the same day along with intravitreal antibiotic injection. Similar reports published by Arikan Yorgun et al. and Marchino et al. recommended immediate vitrectomy and removal of implant to reduce the bacterial overload and improve the visual outcome. It is hypothesized that the most common source of infection after intravitreal injection is normal conjunctival flora. Repeated intravitreal injections with the use of prophylactic postinjection antibiotics increase the risk of drug resistance. Aerosolized droplet contamination from the oropharyngeal tract may occur leading to streptococcal infection. This can be minimized by wearing a sterile mask and avoiding talking or coughing during the procedure. 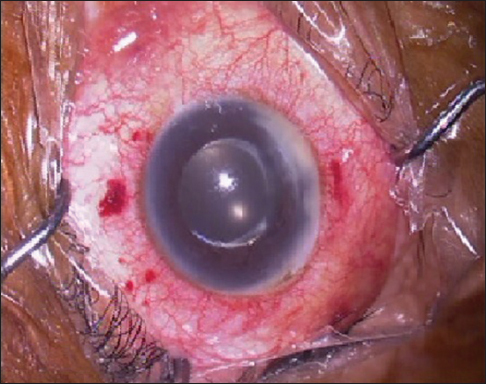 In conclusion, our case demonstrated that endophthalmitis can occur after intravitreal dexamethasone implant, and postinjection prophylactic antibiotic use could have been a risk factor. Immediate vitrectomy with removal of the implant appears as a successful treatment strategy. Retaining the implant after vitrectomy and intravitreal antibiotic injection needs further studies. Chan A, Leung LS, Blumenkranz MS. Critical appraisal of the clinical utility of the dexamethasone intravitreal implant (Ozurdex) for the treatment of macular edema related to branch retinal vein occlusion or central retinal vein occlusion. Clin Ophthalmol 2011;5:1043-9. Ciulla TA, Walker JD, Fong DS, Criswell MH. Corticosteroids in posterior segment disease: An update on new delivery systems and new indications. Curr Opin Ophthalmol 2004;15:211-20. Shah AR, Xi M, Abbey AM, Yonekawa Y, Faia LJ, Hassan TS, et al. Short-term efficacy of intravitreal dexamethasone implant in vitrectomized eyes with recalcitrant diabetic macular edema and prior anti-VEGF therapy. J Ophthalmic Vis Res 2016;11:183-7. McCannel CA. Meta-analysis of endophthalmitis after intravitreal injection of anti-vascular endothelial growth factor agents: Causative organisms and possible prevention strategies. Retina 2011;31:654-61. VanderBeek BL, Bonaffini SG, Ma L. The association between intravitreal steroids and post-injection endophthalmitis rates. Ophthalmology 2015;122:2311-5.e1. Arikan Yorgun M, Mutlu M, Toklu Y, Cakmak HB, Cagil N. Suspected bacterial endophthalmitis following sustained-release dexamethasone intravitreal implant: A case report. Korean J Ophthalmol 2014;28:275-7. Storey P, Dollin M, Rayess N, Pitcher J, Reddy S, Vander J, et al. The effect of prophylactic topical antibiotics on bacterial resistance patterns in endophthalmitis following intravitreal injection. Graefes Arch Clin Exp Ophthalmol 2016;254:235-42.